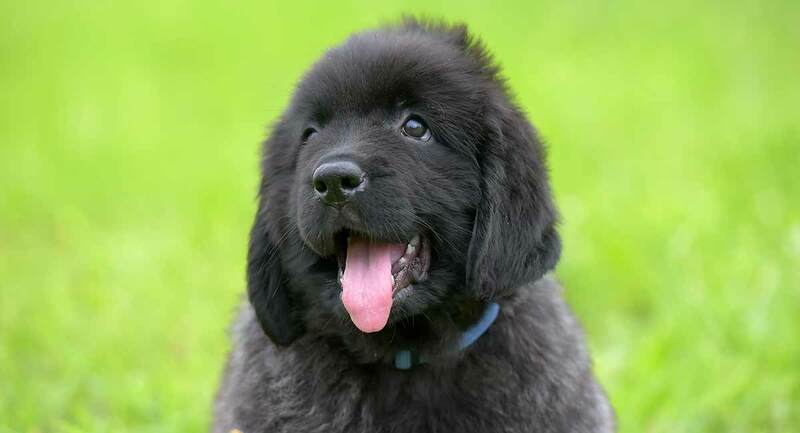 Today we’re looking at the best Newfoundland dog names for your dog! The Newfoundland dog is quite a sizable pup! These dogs – mere armfuls as puppies – can easily top 150 pounds as they grow up! Yet size is no obstacle to dog owners who adore this breed above all others. And Newfoundlands, with their wonderful floppy ears and long shaggy coats, are sometimes nicknamed “nanny dogs” for their well-known babysitting talents. Newfs or Newfies, as these dogs are sometimes called, are truly a dog breed apart. You probably arrived here because you are seeking a name as unique as your new Newfie puppy or rescue dog, and we’ve got loads of fun and creative naming ideas for you here! As you might already have guessed, the Newfoundland dog is a breed originally bred and developed in Newfoundland in Canada. Stories of the bravery, selflessness, loyalty, and love demonstrated by this noble breed can be found scattered all along the 8,000-mile route followed by none other than Lewis & Clark, the early North American explorers. Their Newfie, Seaman, helped put dinner on the table (literally – Newfies are great hunting dogs) and guarded the camp. And the celebrated English poet, Lord Byron, may have penned as many of his famous literary works about his beloved Newf, Boatswain, as he did about his human love interests! Despite their size, Newfoundland dogs are excellent swimmers. They can hold their breath for a long time – definitely long enough to rescue sailors who fall overboard. While the dog is not named, historical records indicate a Newfoundland saved none other than Napoleon Bonaparte when turbulent seas knocked him right out of his ship! And a brave Newfie named Hairyman saved 180 immigrants from Ireland, who would have otherwise perished when their vessel was wrecked in 1832. More recently in Minnesota, a Newfoundland named Murphy somehow sensed that his 95-year-old neighbor had fallen down inside his home. Murphy ran to the door and barked until someone came to help! Murphy. Hairyman. Seaman. Boatswain. These are just a few of the most historically popular and famous Newfoundland names and the stories behind them. When naming your Newfie, you will be using the name you pick many times each day in lots of different situations. So you want to pick something suitably short, simple to say, and not too terribly embarrassing if you need to yell it out in public! Now read on for lots more great Newfoundland naming ideas! Female Newfoundland dogs don’t generally grow as big as their male counterparts, although once a pup has hit the 100-pound mark, big is big! Both males and females are equally trainable, trusting, loving, and people-oriented. These female Newfoundland dog names showcase some of the best qualities of the Newfie! The male Newfoundland in full long coat can look enormously imposing! Who could ever suspect these giant pooches turn into marshmallows around “their” people – and especially children? These fun male Newfoundland names pull double duty to showcase the tough and tender sides of these wonderful companion canines. To check out more awesome male dog names, you’ll want to bookmark this article. A Newfoundland’s very size means these dogs can afford to play it cool before jumping into action on their people’s behalf. These super cool Newfoundland dog names give a nod to the cool character underneath all that shaggy fur! Craving more cool dog names? This article has what you’re looking for. Is there anything cuter than a truly tiny newborn Newfie puppy? These cute Newfoundland dog names will always remind you of your giant pup’s puppyhood! Caring for kids is serious business, but there is also so much lightness, joy, and laughter, as these funny Newfoundland dog names highlight! There is no other dog breed quite like the unique Newfoundland dog. One of these unique Newfoundland dog names might be the perfect pick for your new pup! Find more naming inspiration with this list of unique dog names. When the situation calls for it, your Newfoundland will be right in the thick of it: rescuing, fighting, hunting, guarding, doing the heavy lifting to help and protect you and your family! These tough Newfoundland dog names pay homage to the courage this dog breed is known for! For more tough pup names, check out the name ideas on this list. Did you know this dog may have been in existence all the way back to the time of the ancient Vikings? In fact, the Newfoundland dog and the Labrador Retriever, the most popular pet dog breed in the United States for the past 26 years straight, both hail from Newfoundland. While the origin of each breed is still somewhat shrouded in mystery, canine historians believe both dog breeds at some point were crossed with the Pyrenees sheepdog. According to the official American Kennel Club (AKC) breed standard, the Newfoundland dog’s coat can be black, brown, gray, or white and black with white markings. Other non-standard yet fairly common coat colors can include beige, black and tan, white and brown, or white and gray. But while the Newfie is definitely a looker, it is this dog’s personality that has solidified the breed’s enduring popularity worldwide. Even the official AKC breed standard makes special mention of this dog’s sweet-tempered personality, emphasizing this as the number one defining characteristic of the Newfoundland breed as a whole. Congratulations on your choice to share your life with a sweet, smart, loving, and loyal Newfoundland dog! We would love to hear what name you finally select for your precious Newfoundland pooch! Weis-Corbley, G., “Another Newfoundland Hero Dog Senses Trouble and Saves the Day,” Good News Network, 2010. Saunders, P., “That Dog on the Postage Stamp: Courage, Docility, and Faithfulness are Characteristics of the Newfoundland,” Newfoundland Club of America, 2013. Dandurant, K., “Newfie Days returns to Eliot,” Sea Coast Online, 2017. Frazier, L., “A state dog for Oregon? Newfoundland suggested for the job,” Oregon Live, 2016. Whitfield, A., “History of Newfoundland Dogs,” High Country Newfoundlands Kennel, 2018. Hogstad, E., “Why We Owe ‘The Flying Dutchman’ To A Dog,” Interlude, 2016.